In 1904 an un-named lady visitor donated £20 towards the establishment of a Roman Catholic Church or Chapel of ease in Crowborough. This was to become the church of a new and independent parish. It was mainly the work of Fr Emile Burt, rector of Herons Ghyll 1909-1922. 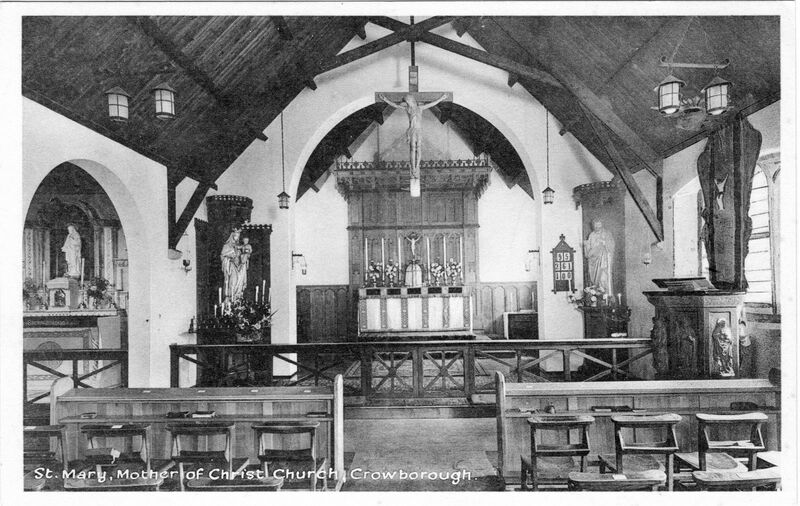 It was in September 1911 that a small plot of land was staked out on the south side of Crowborough Green for the new Catholic Chapel in Crowborough. It was to be a fairly modest building with a seating capacity for about 100 people. The cost was estimated at £350 and the builders would be a local firm, Messrs Connor Brothers of Crowborough Hill. Crowborough ceased to be a chapel of ease to Heron's Ghyll on 10th December 1922, and became a church in its own right. At that time the Catholic Community of Crowborough depended for their pastoral care on the Rector of the Mother Church of Heron's Ghyll, some four miles south of the town. The scene on that memorable Christmas Day of 1911 is vividly brought to life by a quotation from the diary of the then Sacristan: - "The place looked quite beautiful, everyone went to Communion. Mr. Corfe played the organ for us, and Donovan and young Connolly served." The first Baptism in the new Church is recorded as taking place on 21st July 1912, with the first convert to the Catholic faith being received into the Church the next day and the first group of Confirmations on 28th July. Ten years later, on 21st February 1922, Father Burt was moved to Mortlake (South-West London) and at the same time plans were set afoot for the separation of Crowborough from Heron's Ghyll. Gradually, over those early decades the Church was architecturally and liturgically improved to provide a more inspiring setting for divine worship. In April 1912 the Tabernacle, Sanctuary Lamp and Ciborium were bought from Hayes & Finch. The first set of Stations of the Cross was presented by a Lady Matthews in 1913. The present set dates from 1925. The images used on this screen have been provided by kind permission of TheWeald.Org and William Chewter (from his private collection) and whilst not of our church are used to give a sense of that period in our history. If you have or know the whereabouts of images of St Mary's during this period we would love to here from you.